Each Eucharistic prayer has a section that is described by a fancy Greek word: anamnesis. It is often translated as “remembering” and is the part of the prayer when we remember what God has done for us in the past and look to the future. For instance, in Eucharistic Prayer 1: “Recalling his death, proclaiming his resurrection, and looking for his coming again in glory…” Literally, the word means something like “not forgetting” and that’s the translation I prefer. It’s easy for me to forget the saving deeds of Christ and God’s final consummation of all things. I’m also aware that it’s easy for me to forget—ignore—large aspects of life in this city. I found myself thinking about that last Thursday evening when several of the In Ministry Year students and I spent time on the streets of Montreal, visiting with homeless people in the cold January dark. We were working with Al Harrington, indigenous ministries coordinator at St. George’s Place du Canada and his Wolf Pack Street Patrol. 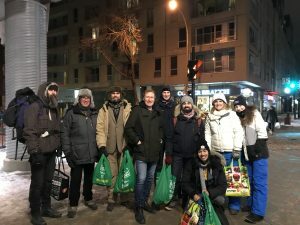 Several nights a week, Al and volunteers walk several miles through downtown Montreal distributing food, socks, gloves, blankets, and other necessities. That night, I had a conversation with a woman preparing to spend the night in a downtown metro station. She wanted to tell me about how a homeless friend of hers had died earlier that day. It was clear to me that part of the reason she was telling me this was that she wanted someone—anyone—to remember his life. More than that, she herself wanted to be remembered, to know that someone was paying attention to her even if only for a few moments. In that context, the water and socks I was able to give her didn’t seem like much but I was glad that in that moment at least she wasn’t feeling forgotten. We hear a lot in the church these days about the need to go out to the people, rather than waiting for them to come to us. This is good advice. I do not, however, think that it means abandoning what we do inside the church. As the anamnesis makes clear, one of the things we do in every Eucharist service is not forget. As I went out on patrol with Al last week, I realized that I could also not forget outside the walls of the church as well. I could not forget the man who had died or the woman preparing for another night on the floor. These are just two of the many people who tend to be pushed aside, ignored—forgotten—in the midst of our world. The Eucharistic shaping of my worship life encompasses not just to what happens in our chapel but also what happens when I am outside the college as well. The anamnesis is just one part of the Eucharist. Embedded in our liturgies are a whole series of actions and orientations that are meant to lead us to fullness of life. What do you find in these liturgies that can reshape your life—and the lives of others—outside the church walls as well? This message was written by College Principal Jesse Zink for this week’s Wingèd Ox, a weekly news digest distributed to the college community.